Major supermarkets must do more to end human suffering in supply chains. Millions of women and men who produce our food are trapped in poverty and face brutal working conditions, despite billion-dollar profits in the food industry, a new report published by Oxfam has revealed. 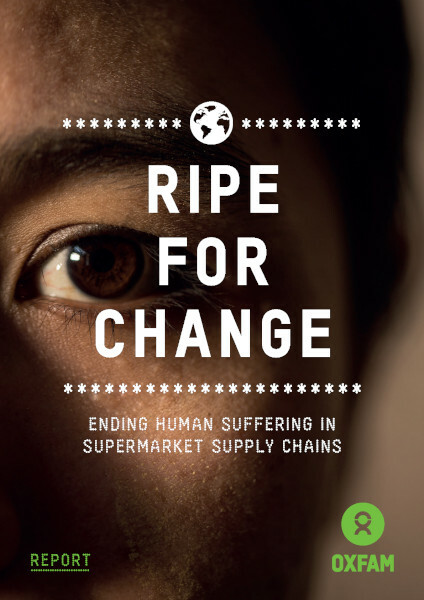 The report, ‘Ripe for Change’, also assessed the policies and practices of some of the biggest supermarkets in Europe and the United States – all of which score poorly on issues such as the treatment of workers and producers in their supply chains. Supermarkets keep an increasing amount of the money their consumers spend – as much as 50 per cent in some cases – while the share that reaches workers and food producers has fallen – sometimes to less than 5 per cent. While many workers and smallholder farmers live in poverty, the eight largest publicly-owned supermarket chains generated nearly a trillion dollars in sales, USD22 billion in profit, and returned USD15 billion to shareholders in 2016. Just 10 per cent of what the three biggest supermarkets in the United States returned to shareholders in 2016 would be enough to lift 600,000 Thai shrimp-processing workers to a living wage. A five-country survey of workers and small-scale farmers revealed that the majority struggle to feed themselves and their families. In South Africa over 90 per cent of surveyed women workers on grape farms reported not having enough to eat in the previous month, and in Italy 75 per cent of women workers on fruit and vegetable farms said they, or a family member, had missed meals in the previous month because they could not afford sufficient food. The report also assesses the biggest and fastest-growing supermarkets in Germany, the Netherlands, the UK and the USA on their publicly available supply chain policies and reported practices. All 16 supermarkets scored very low marks across all the issues including the transparency of their supply chains, and the treatment of workers, small-scale farmers and women in those chains. For example, all the supermarkets scored zero on supporting their suppliers to pay decent wages, and only four supermarkets scored above zero on empowering women in their supply chains by, for instance, incentivising their suppliers to address gender inequalities. Oxfam and the Sustainable Seafood Alliance looked in detail at working conditions at some of the biggest shrimp processors and exporters in Thailand and Indonesia, respectively, which supply some of the biggest supermarkets in the USA and Europe, among them Ahold Delhaize, Aldi North and South, Lidl and Whole Foods. Workers described unsafe conditions, poverty wages, strictly controlled bathroom and water breaks, and verbal abuse. In Thailand, over 90 per cent of seafood processing workers surveyed said they had not had enough to eat in the previous month. Around 80 per cent of workers in these plants are women. “When we were menstruating, we couldn’t change pads, because during work we couldn’t bring anything in,” said Melati, one of the tens of seafood factory workers interviewed by the Sustainable Seafood Alliance Indonesia. Melati also suffered chemical burns on her arms from having to clean with chlorine without adequate protection. “The private sector has the potential to lift millions of people out of poverty, but the food industry, like too many others, is rewarding wealth over women’s work,” Winnie Byanyima, Oxfam International’s executive director, said. “We’ve heard from fruit farmers who have been sprayed with toxic pesticides while in the field and from women who have been forced to take pregnancy tests to work at seafood processing plants,” she continued.